It’s the season of spring cleaning, and many of us who practice this annual routine are not just cleaning out and preparing for the warmer weather to come. When spring cleaning comes around, I’m also preparing bags and boxes of good items I want to give away. A few years ago, I started to realize how much “stuff” I had that I didn’t really wear or want. There were some items and articles of clothing I wanted, but I knew someone else could benefit from them more. These were not worn out clothes either. I either grew tired of them or grew out of them. Needless to say, just because I didn’t personally want them didn’t mean that someone couldn’t use them. Donating or giving away clothes is a great gesture. I believe in the saying, “One persons trash is another ones treasure.” Giving back, especially to those in need, is one of the best acts of kindness one could do. Even giving things away to make a small profit is just as good. You won’t know whose hands your former personal belongings will end up in, but you do know that someone else saw a value in it. Every spring, in an effort to remove the attachments I have to certain items, I pack them up and place them in a clear bag and give them away to local charities or drop them off at clothing bins. Sure, you don’t aways have to give away your good clothes for free. If it’s important for you to benefit financially off of what you give, you can still donate, but do so at Goodwill or Salvation Army where you can receive a reciept for a future tax deductible. If you need fast cash, you can have your own yard sale. Both organizations will gladly accept good, usable items and sell them back at their thrift stores. Goodwill and Salvation Army have estimate forms to help you determine what your donated items were sold for. You’ll need to calculate this, as it will determine how much deductible you can receive. Less fortunate people, who may be in more need as you, will not only find neat things, but could also gain working skills. Goodwill in particular offers temporary jobs and aids in training people for skills and jobs in various industries. When tax season comes, you can claim a tax deduction (make sure you get a receipt) and reduce your tax bill for charitable contributions. My father donated two cars for two years in a row and got huge tax breaks. Yes, you can donate cars too. However, this my only be applicable to certain tax forms. Keep in mind, do not use this opportunity as a way to give away junk. And by junk, I mean stained, tattered clothes, or rickety, non-working items. That’s what the trash is for. Don’t give away things you wouldn’t even give to family. 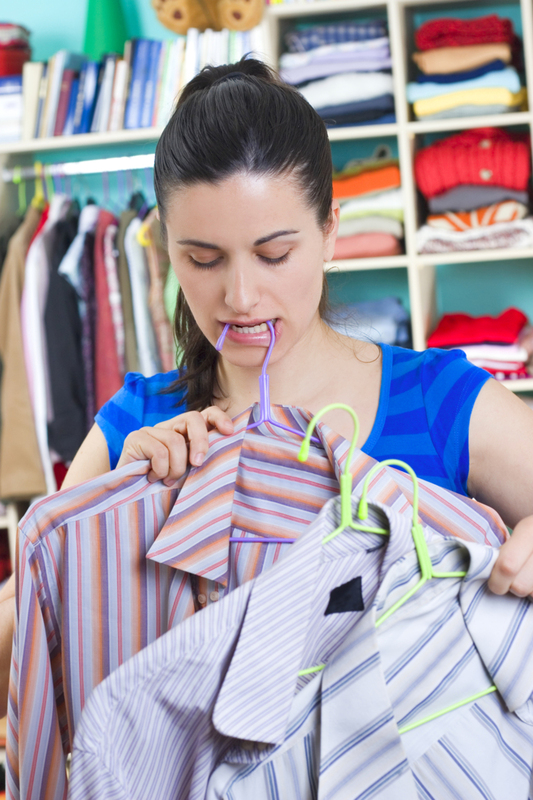 Inspect your items for holes, stains, fabric condition, and all sorts of undesirable qualities before giving away. So if you plan to clean house this spring, or already have, think about all the things you don’t want. Don’t just throw them in the trash, and allow them to be gone and destroyed forever. Many charities have clothing bins located in almost every major city. These bins can usually be found in the parking lots of megastores, strip malls, and gas stations. Check online for locations near you. There are also organizations that have group specific donations—if you want to donate your used things only to veterans, the homeless, single and teen parents, or disaster victims, you can also find that. Think about those in need, or people who don’t have the privilege of giving away. You can give back to your community in so many ways just by donating. Happy spring cleaning! Have you ever donated clothes before? Share your experience and why.